Senior citizens need stocks that can produce growth and income -- while keeping the peace of mind that their money is safe. Here are two that work. If you're retired or getting close to it, you're likely to have completely different investment objectives than younger people do. Instead of worrying about long-term growth and wealth creation, as you get older your focus gradually shifts toward income and capital preservation. And, while bonds can be great for income, the right kind of stocks allow your nest egg to grow and keep up with inflation while simultaneously producing a rising income stream. With that in mind, here are two stocks that are great examples of the type of investments that work well in senior citizens' portfolios. Many senior citizens are concerned (and rightly so) that, with the stock market hovering near all-time highs, a correction could be right around the corner. And while there is no such thing as a completely crash-proof stock, Wal-Mart (NYSE:WMT) is pretty close. The company has a unique business model that allows it to prosper in good times and bad. The general idea behind Wal-Mart's success is that by purchasing in high quantities from manufacturers and creating a low-frills shopping experience, the company is able to undercut its competitors while still maintaining an acceptable profit margin. Wal-Mart has a loyal following of budget-conscious customers, and during good economic times, these customers have a growing amount of money to spend. On the other hand, consumers have less money to spend in bad economic times, but Wal-Mart's discounted one-stop-shop business model attracts more customers, who would typically shop at higher-end retailers. The proof is in the numbers. 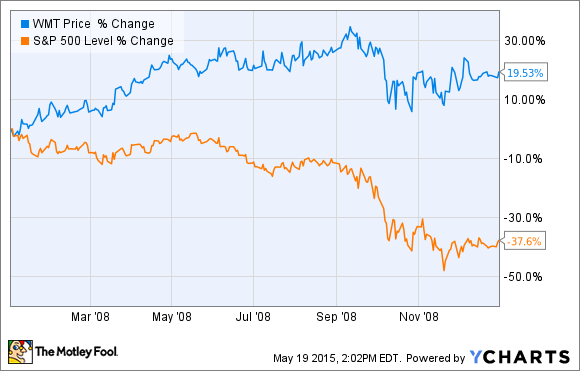 During 2008, the S&P lost 37.6% of its value while Wal-Mart actually gained 19.5%. In fact, Wal-Mart's sales grew each and every year during the recession and its dividend continued to climb, as it has for 40 consecutive years. As far as valuation goes, now may be a great time to get into Wal-Mart, as the stock is down 15% from its January highs, thanks to a combination of factors -- currency fluctuations, a disappointing earnings report, and increased labor cost stemming from the company's decision to raise its own minimum wage. In fact, Wal-Mart trades for just 15.2 times TTM earnings, far below the 20.1 average of the S&P 500 and more attractive than Wal-Mart's own P/E in recent history, which had climbed as high as 18 earlier in 2015. Finally, despite its size, Wal-Mart has plenty of room to grow. Its small-format neighborhood market store concept has plenty of room to grow, and there is vast potential for Wal-Mart to capitalize on e-commerce. In fact, Wal-Mart recently announced its intention to form a membership service similar to Amazon Prime, where customers would get free shipping on online orders. When you think of stable investments, real estate may not be the first thing that comes to mind, especially considering the craziness in the mortgage market that took place just a few years ago. However, the right kind of real estate investment trust, or REIT, could be a great way to achieve growing income and strong long-term returns, while at the same time providing you with peace of mind. In the REIT space, my personal favorite is Realty Income (NYSE:O), which invests primarily in free-standing retail properties. It buys properties in desirable locations, and then leases them to high-quality tenants, many of which are solid national brands like Walgreens and FedEx. Currently, the company owns more than 4,300 properties, spread out among 49 states and Puerto Rico. There are a few reasons why Realty Income's business model makes it a stable choice for senior citizens. For starters, the company doesn't borrow too much money. Realty Income's debt (preferred stock included) stands at just 31% of the company's total capitalization. In other words, the company has virtually no risk of becoming "underwater" on its properties, no matter how bad things get economically. Furthermore, Realty Income's tenants operate in 47 different industries, so the company wouldn't be too affected if say, electronics retailers suddenly took a turn for the worse. And, Realty Income's tenants are all on long term (10-20 year) "net" leases, which means that tenants pay property taxes, building insurance, and maintenance expenses. So, the long-term leases mean that tenant turnover is kept to a minimum, and the net leases reduce the company's vulnerability to fluctuating expenses. The combination of long leases and desirable property locations has produced an impressive record of occupancy, which currently sits at 98.4%, and hasn't dipped below 96%, even during the financial crisis. Realty Income is a solid choice for income-seekers, with a 4.8% dividend yield that is paid out monthly. The dividend has been raised for 70 consecutive quarters, and has grown at an average rate of 5% per year, which could help you keep up or even beat inflation. And thanks to acquisitions and growing property values (among other factors); the company has delivered a 17.4% average annual total return since going public in 1994. Finally, just like Wal-Mart, Realty Income is trading at somewhat of a "discount" thanks to economic factors beyond its control, such as the expectation of rising interest rates which shouldn't really have much of an impact on the company's bottom line since it doesn't borrow too much money. Shares are down 14% since late January, and trade for 17.6 times the company's 2015 FFO (funds from operations -- similar to a P/E multiple for REITs) projections, down from a multiple of about 20.3 just a few months ago. These are just two of the many stocks that make excellent investments, even after retirement. However, the reasons given for these can be applied to other stocks -- manageable debt levels, consistently growing dividends, businesses that work well in good times and bad. Even though risk tolerance declines as investors age, quality stocks like these and others like them should still make up a significant part of a well-rounded investment portfolio.